Drill bits are cutting tools used to create cylindrical holes, almost always of circular cross-section. Bits are held in a tool called a drill, which rotates them and provides torque and axial force to create the hole. Specialized bits are also available for non-cylindrical-shaped holes. The spiral (or rate of twist) in the drill bit controls the rate of chip removal. A fast spiral drill bit is used in high feed rate applications under low spindle speeds, where removal of a large volume of swarf is required. Low spiral drill bits are used in cutting applications where high cutting speeds are traditionally used, and where the material has a tendency to gall on the bit or otherwise clog the hole, such as aluminum or copper. The point angle, or the angle formed at the tip of the bit, is determined by the material the bit will be operating in. Harder materials require a larger point angle, and softer materials require a sharper angle. The correct point angle for the hardness of the material controls wandering, chatter, hole shape, wear rate, and other characteristics. The lip angle determines the amount of support provided to the cutting edge. A greater lip angle will cause the bit to cut more aggressively under the same amount of point pressure as a bit with a smaller lip angle. Both conditions can cause binding, wear, and eventual catastrophic failure of the tool. The proper amount of lip clearance is determined by the point angle. A very acute point angle has more web surface area presented to the work at any one time, requiring an aggressive lip angle, where a flat bit is extremely sensitive to small changes in lip angle due to the small surface area supporting the cutting edges. The length of a bit determines how long a hole can be drilled, and also determines the stiffness of the bit and accuracy of the resultant hole. Twist drill bits are available in standard lengths, referred to as Stub-length or Screw-Machine-length (short), the extremely common Jobber-length (medium), and Taper-length or Long-Series (long). 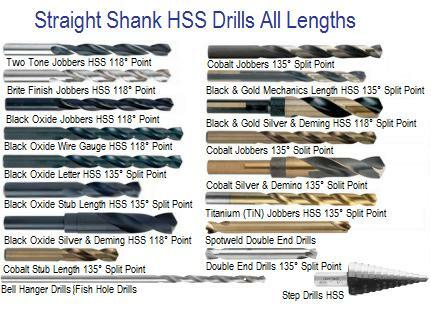 Most drill bits for consumer use have straight shanks. For heavy duty drilling in industry, bits with tapered shanks are sometimes used. The diameter-to-length ratio of the drill bit is usually between 1:1 and 1:10. Much higher ratios are possible (e.g., "aircraft-length" twist bits, pressured-oil gun drill bits, etc. ), but the higher the ratio, the greater the technical challenge of producing good work. The best geometry to use depends upon the properties of the material being drilled. The following table lists geometries recommended for some commonly drilled materials. Soft low carbon steel bits are inexpensive, but do not hold an edge well and require frequent sharpening. They are used only for drilling wood; even working with hardwoods rather than softwoods can noticeably shorten their lifespan. Bits made from high carbon steel are more durable than low-carbon steel bits due to the properties conferred by hardening and tempering the material. If they are overheated (e.g., by frictional heating while driling) they lose their temper, resulting in a soft cutting edge. These bits can be used on wood or metal. High speed steel (HSS) is a form of tool steel; HSS bits are hard, and much more resistant to heat than high carbon steel. They can be used to drill metal, hardwood, and most other materials at greater cutting speeds than carbon steel bits, and have largely replaced carbon steels. Cobalt steel alloys are variations on high speed steel which contain more cobalt. They hold their hardness at much higher temperatures, and are used to drill stainless steel and other hard materials. The main disadvantage of cobalt steels is that they are more brittle than standard HSS. Hi-moly tool steel is heat-treated at 1196 C (2185 F) and then nitro-carburize finished at 510 C (950 F) to be measurably harder than high-speed steel. Nitro-carburized steel withstands substantially higher drilling temperatures while maintaining sharpness. Diamond powder is used as an abrasive, most often for cutting tile, stone, and other very hard materials. Large amounts of heat are generated by friction, and diamond coated bits often have to be water cooled to prevent damage to the bit or the workpiece. 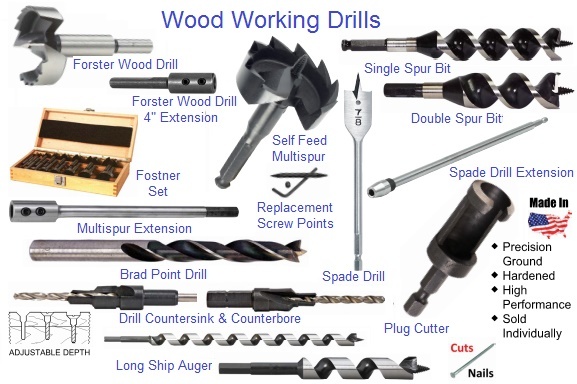 General-purpose drill bits can be used in wood, metal, plastic, and most other materials. The twist drill bit is the type produced in largest quantity today. It comprises a cutting point at the tip of a cylindrical shaft with helical flutes; the flutes act as an Archimedean screw and lift swarf out of the hole. The twist drill bit was invented by Steven A. Morse of East Bridgewater, Massachusetts in 1861. The original method of manufacture was to cut two grooves in opposite sides of a round bar, then to twist the bar (giving the tool its name) to produce the helical flutes. Nowadays, the drill bit is usually made by rotating the bar while moving it past a grinding wheel to cut the flutes in the same manner as cutting helical gears. Twist drill bits range in diameter from 0.002 to 3.5 in (0.051 to 89 mm) and can be as long as 25.5 in (650 mm). The geometry and sharpening of the cutting edges is crucial to the performance of the bit. Small bits that become blunt are often discarded because sharpening them correctly is difficult and they are inexpensive. For larger bits, special grinding jigs are available. A special tool grinder is available for sharpening or reshaping cutting surfaces on twist drill bits in order to optimize the bit for a particular material. Manufacturers can produce special versions of the twist drill bit, varying the geometry and the materials used, to suit particular machinery and particular materials to be cut. Twist drill bits are available in the widest choice of tooling materials. However, even for industrial users, most holes are drilled with standard high speed steel bits. The most common twist drill bit (sold in general hardware stores) has a point angle of 118 degrees, acceptable for use in wood, metal, plastic, and most other materials, although it does not perform as well as using the optimum angle for each material. In most materials it does not tend to wander or dig in. A more aggressive angle, such as 90 degrees, is suited for very soft plastics and other materials; it would wear rapidly in hard materials. Such a bit is generally self-starting and can cut very quickly. A shallower angle, such as 150 degrees, is suited for drilling steels and other tougher materials. This style of bit requires a starter hole, but does not bind or suffer premature wear so long as a suitable feed rate is used. Drill bits with no point angle are used in situations where a blind, flat-bottomed hole is required. 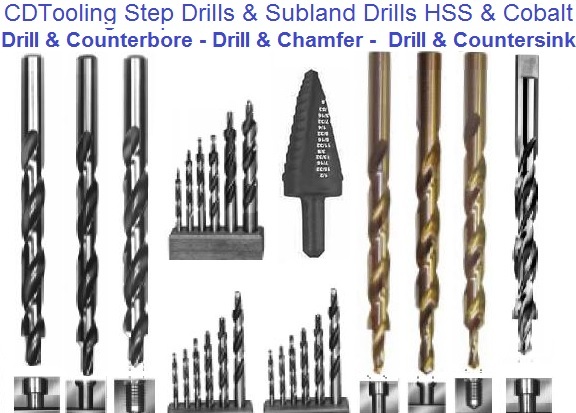 These bits are very sensitive to changes in lip angle, and even a slight change can result in an inappropriately fast cutting drill bit that will suffer premature wear. Long series drill bits are unusually long twist drill bits. However, they are not the best tool for routinely drilling deep holes, as they require frequent withdrawal to clear the flutes of swarf and to prevent breakage of the bit. Instead, gun drill bits are preferred for deep hole drilling.